• Zlotnikov, A., Lebedev, A., Puhova, F., Sergeev, V. (2005) Albit on sugar beet. Protection and quarantine of plants Nr 5. p. 26-27. • Zlotnikov, A., Lebedev, A., Alehin, B., Sergeev, V. (2005) Albit is a new complex high-effective formulation for sugar beet. Sugar beet. Nr 7. p. 36-38. • Methodology of Albit application overviewed in: Bukin., Zlotnikov, A., Perov, A. (2005) Adapted technology of sugar beet cultivation in Republic Mordovia. Published by Mordovian State University, Saransk, 20 pages. Sugar beet is one of the most economically important plant species in agriculture. One can note, that while the average profitability of agriculture in 2004 was 15 %, in case of sugar beet it was 81 %. In addition, sugar beet is one of the most Albit-sensitive cultures: yield increase due to Albit application is 4.81 t/ha averagely. The minimal detected yield increase over control in conducted trials was 1.7 t/ha (in Tula oblast), the maximal one was 14.5 t/ha (Krasnodar kraj). In farms of Krasnodar kraj (Chapaev pedigree cattle farm, Kuban pedigree farm, etc. ), the average yield increase due to Albit was stably 25-30% in 1999-2004. Also, Albit increases sugar content in roots averagely by 0,3–2,5 % and accelerates maturation. Albit is officially registered in Russia as a fungicide against black leg, cercospora leaf spot and downy mildew of sugar beet. The average Biological effectiveness of Albit against these diseases is 40-70 %, the maximal one is 88 %. Fungicidal activity of Albit against sugar beet diseases is detected for disease prevalence of 41-50 % and disease development of 7-38 %. It is necessary to note, that BE of Albit gets lower the higher prevalence is (above 30 %). In this case, application of Albit with chemical fungicides (minimal doses of the last ones may be applied) is recommended. In practice, Albit is used for yield (Fig. 2, Fig. 3) and sugar content increase, acceleration of seed germination, activation of growth and development (Fig. 4), increasing of resistance to unfavorable climate conditions, relieving of herbicidal stress (Fig. 5, Fig. 6), protection against diseases (black leg, downy (perenosporosis), cercospora blight) and increase of drought resistance. Presowing seed treatment (Albit may be applied for seed pelleting) and 1-2 foliar sprayings are recommended. Presowing seed treatment with Albit protects plants from black leg, downy, and cercospora blight; increases germination and provides growth stimulation, accelerate phenological growth stages development (especially at the stage of 5-6 leaves (BBCH 15)); increase yield. Application rate of Albit – 100 mL/t. Application rate of working solution – 15 L/t. BE of Albit seed treatment against black leg is approximately the same as that of chemical protectants (fungicides based on a.i. Tiram), but cost of Albit treatment is more than 8 times lower. After such treatment, the period of defense against black leg was 25 days from the moment of germination. At use of coating technology, Albit is compatible with chemical fungicides and insecticides; it relieves chemical protectant-mediated retardation of plant growth and germination. Combined use of chemical protectants and Albit in seed coating technology makes possible prolonged storage of Albit-treated seeds before sowing (All-Russia Institute of Plant Protection, 2005). Despite of high efficiency of Albit presowing seed treatment, many farms have to use only Albit foliar spraying, because seeds are already treated (coated). Thus, Albit should be integrated into existing seed treatment technologies to use its high potential. The most effective method of Albit application on sugar beet is foliar spraying. 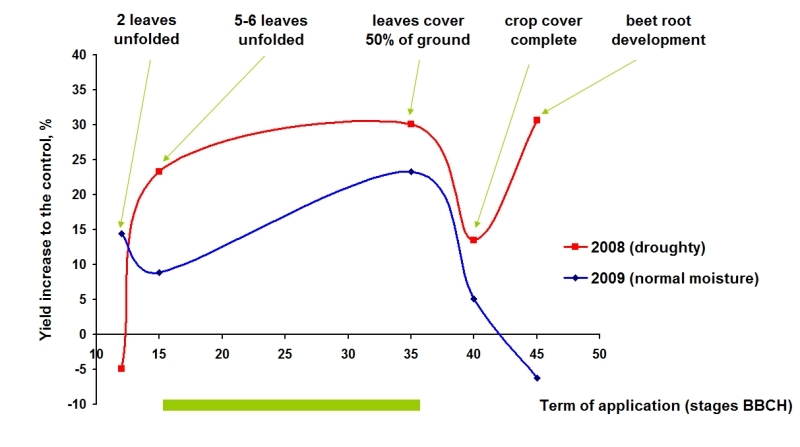 Albit should be applied from the stage of 5-6 real leaves (1-2 fold, 30-40 mL/ha, BBCH 35) with interval 10-20 days. Application rate of working solution – 300 L/ha (Fig. 7). Use of Albit is effective for foliar spraying in tank mix pesticides. A higher dose (40 mL/ha) is applied for plant immunization. Albit application before and after mentioned period could not provide the desired effect. 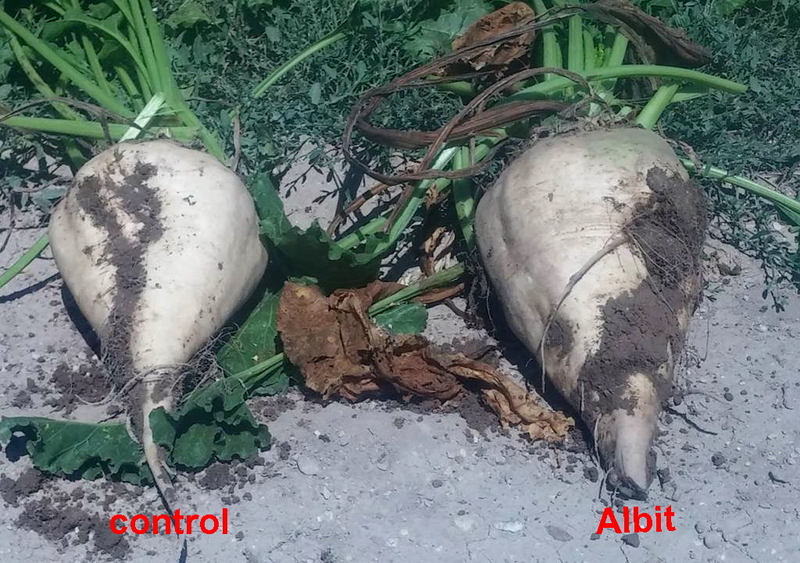 Albit should be applied together with scheduled treatments of sugar beet with herbicides, insecticides, and fungicides. 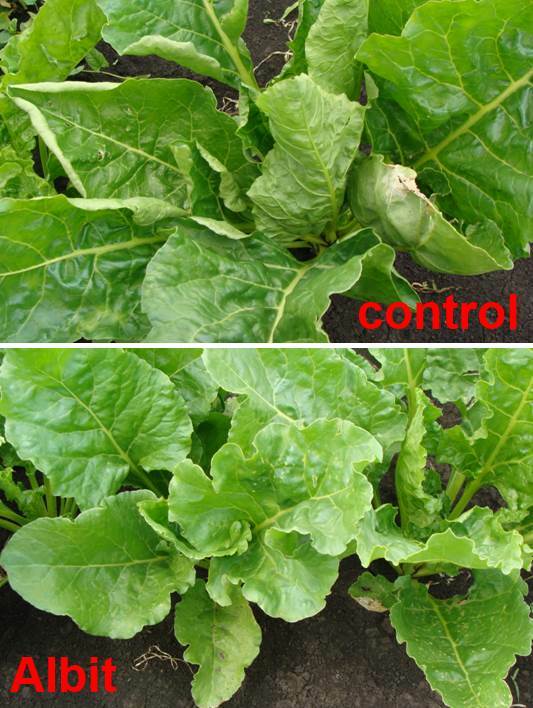 When combined with chemical pesticides Albit efficiency increases significantly, since in this case Albit acts not only as biostimulant and immunizer, but also as an antidote (relieves stress impact of pesticides on sugar beet). 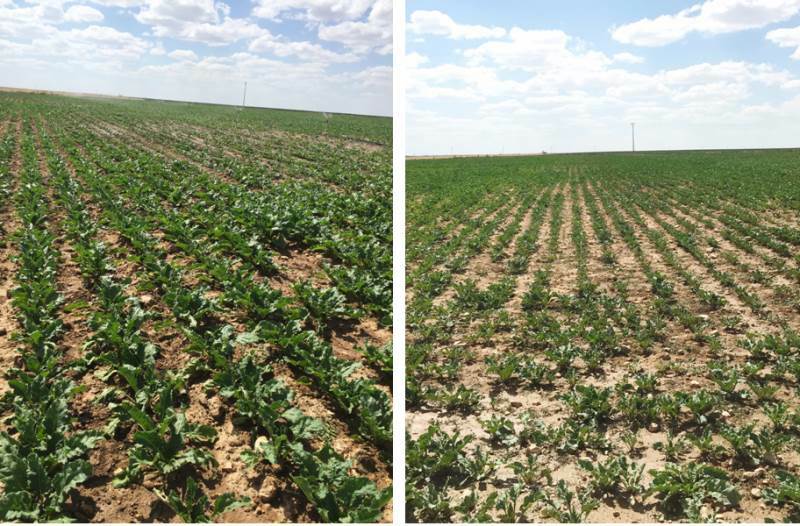 First foliar spraying provides prerequisites for future high yield and sugar content (by means of growth stimulation), increases drought resistance, immunizes plants against downy mildew, and relieves herbicidal stress. Herbicidal stress can lead to growth retardation, withering, decrease of photosynthesis intensity; yield loss might be up to 50 %. This effect was proved in field trials with Albit + herbicides based on quizalofop-P-tefuryl, phenmedipham, ethofumesate, desmedipham, triflusulfuron-methyl, clethodim, clopyralid, haloxyfop-P-methyl, fluazifop-P-butyl, dicamba, triasulfuron and others. Albit might be also used separately, after 4-7 days after herbicidal treatment. Such treatment relieves effects of herbicide overdosage (especially at use of several strong herbicides), abolishes growth retardation and plant oppression. Albit also grants increase of drought resistance by 10-60%; plant can easier survive hot weather and lack of water. For example, using of Albit in Krasnodar kraj in droughty 2003 helped to get the same yield, as in not-droughty 2002. Albit is the only formulation, officially recommended in Russia as a mean for increase of drought resistance of field crops. The second foliar spraying promotes redistribution of nutrients from leaves to roots, increases sugar content and accelerates maturation. As was demonstrated in trials of All-Russia institute of Plant Protection, presowing seed treatment influences only on yield, but not on sugar content. To increase the sugar content, it is necessary to use Albit foliar spraying. The second foliar spraying also provides reliable immunization against cercospora leaf spot. Since Albit suppresses disease development through immunization, to control air infections it should be used before appearance of the first signs of disease. At the danger of epiphytoty the second Albit foliar spraying should be combined with halved doses of fungicides. High effectiveness of such approach was demonstrated in Chapaev pedigree cattle farm of Krasnodar kraj. As was already mentioned above, Albit treatments of sugar beet accelerate its maturation. This acceleration makes possible gathering in a good harvest even on the very north of beet growing region: in Mordovia, Moscow and Nizhnij Novgorod oblasts. 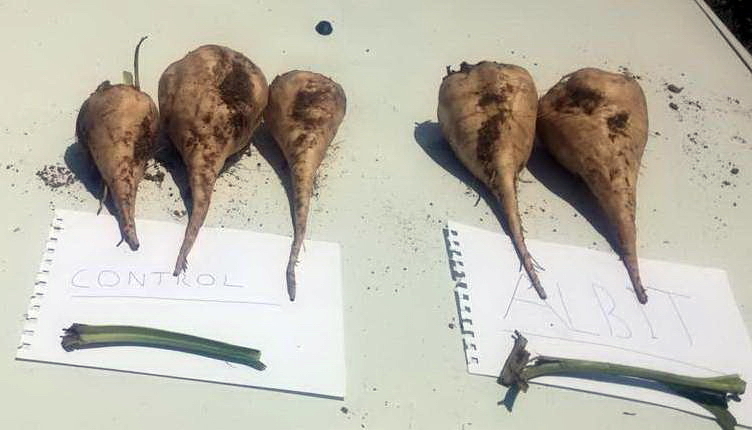 Albit shows high economic efficiency on sugar beet. In the trial conducted in All-Russian Research Institute of Plant Protection (2002) profitability of Albit application was 1010%, payback - 11.1. 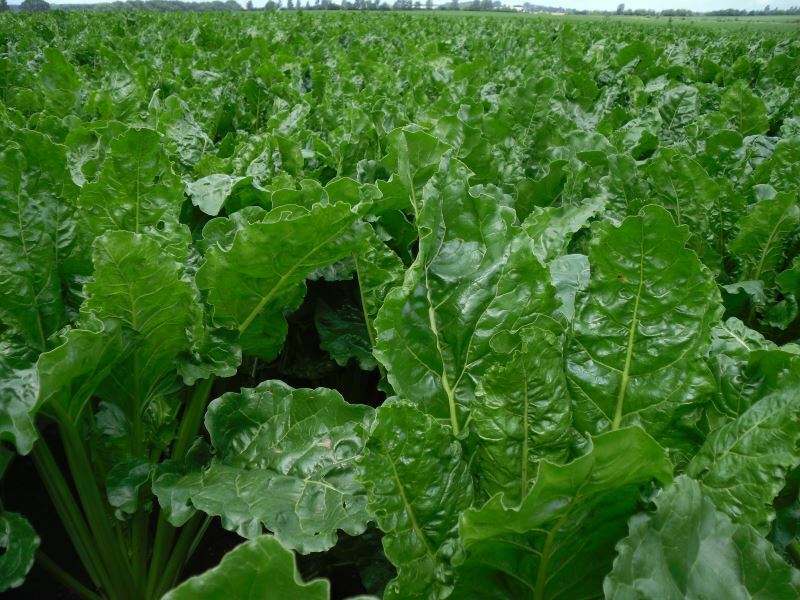 Net profit from the use of Albit on sugar beet in the agricultural farm "Agrocomplex" in Krasnodar kray on long-term data of Russian Bureau of Agriculture was 3220-4020 rubles/ha, payback from 12.7 to 23 times. Each litre of Albit gives extra yield of sugar beet (in average 59.8 tons). Many years Albit has been successfully used in Tambov farm Memory of Kirov. According to long-term results of State statistics of 2001-2004, this farm is the most profitable farm among all beet brunches in Russia. Due to high effectiveness of Albit for sugar beet cultivation, it is being used in many regions of Russia (Krasnodar kraj, Tambov, Voronezh, Lipetsk oblasts, Republic Moprdovia and in other oblasts) firstly for treatment of sugar beet. Since 1999, Albit have been examined in tests of All-Russia Institute of Plant Protection, Mazlumov All-Russia Institute of Sugar Beet and Sugar, North-Caucasian Institute of Sugar Beet and Sugar, Regional Plant Protection Stations (branches of Russian Agricultural Centers). In Krasnodar krai, Albit demonstrated the high efficacy in the following large farms: Breeding factory Kuban’, Agrokompleks, Nasha Rodina, Mir, V.I. Chapaev Breeding factory, Hoper-Agroprodukt, Tbilisskii semennoi zavod. In Stavropol’ krai - collective farm Polyarnaya zvezda and V.I. Chapaev Breeding factory. Albit is successfully used in beet cultivation in such foreign countries as Austria, Belarus, Germany, Lithuania, Ukraine, Czech Republic, Switzerland. Tests were performed on varieties RMS-73, Ramonskaja odnosemjannaja-47, L’govskaja LMS-94, L’govskaja-52, Ramonskaja-MC46, Severo-Kavkazskaja odnosemjannaja, Adidzhe, Ramonskaja-07 and others.